The small red dot is a seal of quality that specialists as well as consumers are familiar with. Beside the excellent design, the first class material consistence and the functionality are also taken into consideration. Only the best product reaches the finish line. Our Memory was the first medical compression stocking to obtain the „red dot design award“ in 2012. 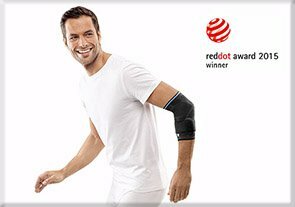 In addition our Dynamics Plus knee support received, even in the year of introduction, the red dot design award for the outstanding quality of its design. We are now pleased to announce that another product of our Dynamics Plus line, our Dynamics Plus elbow support, was able to convince the critical jury and bring the prestigious prize to Bamberg once again in 2015. The Plus for function, quality and design – this goal guided the development of the Dynamics Plus Elbow Support. The result: an orthopaedic support with unequalled wearing comfort. For the first time an extensive Arthroflex® comfort zone has been integrated into the sensitive area of the crook of the arm. The patented special knitted fabric is extra stretchable and fits closely like a second skin. Moreover, the product offers an innovative double act with its multi-functional Plus pads. Integrated on the outside and the inside of the forearm they relieve the entheses at the elbow through targeted pressure. Their soft naps provide a gentle massage, while the silicone material absorbs irritations that occur in the forearm as a result of finger movements. The innovative features are enclosed by an organic design that breaks with conventional models associated with medical products. Based on cells and honeycombs it connects form and function and discreetly caresses the anatomy.